Is the rapid charging mode negative for my batteries? Yes, the faster a battery is charged or discharged, the more it is stressed. This has a negative effect on the cycle life. JayKay developed a BMM (battery management) tailored to the cells, which individually monitors the cells. This charging mode ensures a more gentle charging of your battery. If you need your board again as fast as possible, a push-button at the charging device can be actuated which triggers the rapid charging mode. What is the maximum rider weight? There is no maximum rider weight. As long as the deck can carry the rider, our e-trucks also can. Only the range, maximum speed and the flexibility can suffer under a heavy weight. Can I also mount the e-trucks separately on two different boards? Of course! JayKay e-trucks can also be used individually. However, the range and the performance are halved. For the second deck you can either buy another remote control or you can control it via your smartphone with the JayKay app. In general we recommend to use two e-trucks on one board. Can the wheels be exchanged? The urethane rollers of the wheels can be exchanged very quickly and easily. Spare rollers in different colors are available in our online shop soon. 1 year guarantee on the battery pack. Can I use my JayKay e-truck on public roads | sidewalks? Driving is only permitted on private grounds in Germany. The Federal Highway Research Institute (BASt) met on 25.06.2018 to develop proposals for the classification of electric micro-vehicles and to define conditions. A legalisation will be expected later this year in Germany. Other countries have different regulations. These should be considered before buying. What happens to my board when I fall or jump off? 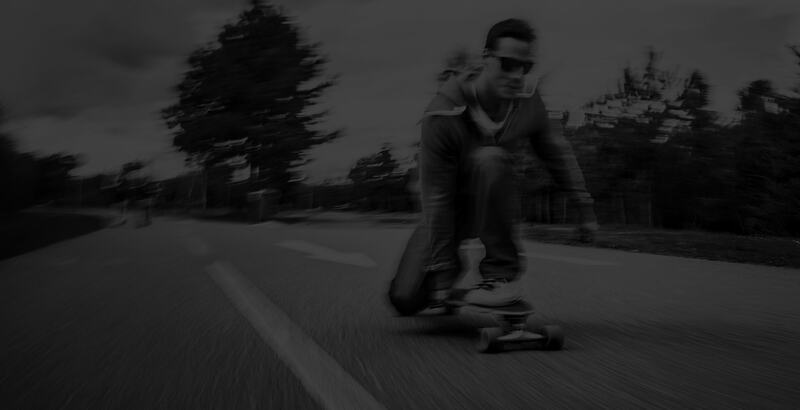 The electronics continuously control the distance between the rider and the board and will automatically brake the board when the distance exceeds 2-3 meters. Can I test the JayKay e-truck before I buy it? Yes. We offer test rides all over Germany. These will be announced on our website and on our social media channels. If your city is not mentioned, just give us a call and we try to consider your wishes on the next tour! We ship within Europe and the USA. Worldwide shipping is planned and will be implemented gradually. Within Germany we ship free of charge. The shipping costs to other countries of the EU are 25,00 €, to non-EU countries 65,00 €. The first batch of the series production is planned to go out in Spring 2019. We are a young company. Therefore there may be small delays in the schedule. We are always striving to help you with all your concerns.